I should admit that I'd avoided this book for some time. How often I had seen it gracing the displays at Waterstones without paying much thought to the contents, despite the beautiful cover, having wrongfully anticipated that this would be too fantastical, too steampunk for my interest. Now I am very glad to report that not only did I purchase it on a whim, it will now prevail as one of the best books I have ever had the pleasure to read. The story begins with the mysterious discovery of a pocket watch by Thaniel Steepleton, a civil servant, when he returns to his tiny London apartment after a busy day at work. Mistaking it for a birthday gift from his sister, he receives the gift gratefully, having no idea at the time that in six months it will save his life from a terrorist attack on Scotland Yard. Elsewhere, Grace Carrow is a physicist who dresses like a man in order to gain unchaperoned access to the university libraries in order to research for her experiments. Also in possession of a watch designed by the mysterious Keita Mori, she is unwittingly drawn into a plot of intrigue and mysterious coincidences which drive the story forward to a conclusion I could not forsee. One of the more intriguing reviews I read over on Goodreads likens the characters to those of Sherlock, Holmes and Mary Russel: a comparison with which I wholly agree. 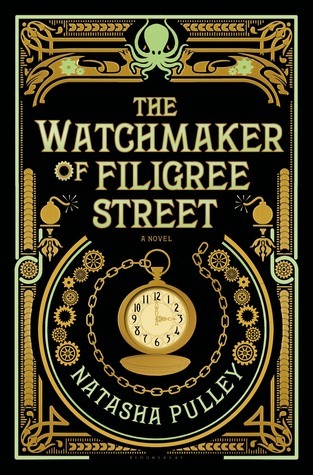 There is a touch of magic in The Watchmaker, which gives the novel a sense of magical realism while ensuring character and plot are forefront in the narrative development. Later this year, Natasha Pulley will publish her second novel, The Bedlam Stacks. As yet, it is unclear whether this will follow on from the events in The Watchmaker, but I look forward to reading it nonetheless. Now if only I could re-read The Watchmaker with the sense of wonder with which I first discovered it, the plot and development unknown. This was indeed a fantastic story which I simply could not put down!